© UNESCO/ Cynthia Guttman -From left to right: Special Advisor to the UN Secretary General Ms Amina Mohammed, UNESCO Director-General Ms Irina Bokova, UNAIDS Deputy Executive Director Mr Luiz Loures and Executive Director Mr Michel Sidibé. Collective action has enabled strong progress in the AIDS response but hard work remains to get to zero new HIV infections, zero discrimination and zero-AIDS related deaths, stated the Director-General to the 32nd session of the Programme Coordinating Board of UNAIDS, gathered in Geneva on 25 June. The Director-General read a statement in her capacity as Chair of the Committee of Co-sponsoring Organizations of UNAIDS, grouping 11 entities and the UNAIDS Secretariat, headed by Michel Sidibé. 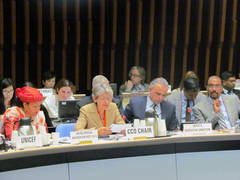 The PCB, comprising 22 Member States, acts as a governing body on all UNAIDS programmatic issues. Reviewing progress, the Director-General noted that since 2001 there has been a 50 percent reduction in the rate of new HIV infections in 25 low- and middle-income countries. A total of 7.1 million people are receiving antiretroviral treatment in Africa, up from less than 1 million in 2005. To push forward, more tailored actions to respond to country needs, more attention to reaching key populations disproportionately impacted by HIV and a sharper focus on youth are required. Today, young people account for 40 percent of all new adult HIV infections. Globally, young women aged 15-24 are most vulnerable, with infection rates twice as high as in young men. “In the post-2015 consultations, youth associations and leaders have made a resounding call for increased access to sexual and reproductive health services and comprehensive sexuality education,” said Mrs Bokova. Cooperation and support of the donor community is more important than ever to go to zero, Mrs Bokova asserted, indicating that financial contributions to UNAIDS are a means to catalyze significant additional resources. For every USD $1 invested in core funding to the Unified Budget and Work plan (UBRAF), co-sponsors expect to raise more than USD$20 in 2014-2015. Still, $7 billion is still required to reach the global target of USD $24 billion by 2015. Mrs Bokova appealed to the board to “jointly carry forward this fight, which is a fight for health, solidarity and human dignity.” Commending Executive Director Michel Sidibé for his leadership and commitment, she affirmed that UNAIDS was a success story of working together and a model that could be replicated in other joint activities of the United Nations for better delivery and stronger impact.